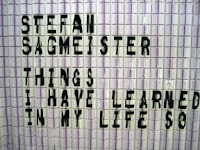 Like chocolate, journaling can be stimulating and deeply personal, or in the case of graphic design superstar Stefan Sagmeister, deeply public. This chocolate bar is part of the creativity sparked by a personal, reflective list written in Sagmeister's diary. The list soon evolved into a series of very public, interactive works of art. If you're in need of some introspection or inspiration, check out Things I Have Learned In My Life, So Far. The creative project encourages reflection, journaling and offers more than a few nuggets of wisdom to chew on.